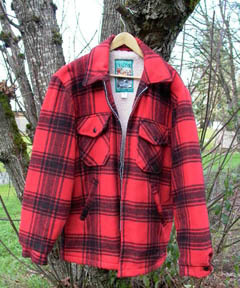 Canyon Guide Outfitters is proud to affix "Union Made" and "Made in U.S.A." tags to this traditional deep woods type of red/black plaid hunting coat. This coat features a zipper front closure, button cuffs, two chest flap button pockets, and side slash pockets. The outer shell is a blend of 30% reprocessed wool, 45% acrylic, 20% polyester, and 5% other fabrics. The pile lining is 80% polyester and 20% acrylic. This coat should be professionally dry cleaned only. I have worn coats of this type during the deer hunting season for years. My last example, probably 20 years old, is now reduced to "emergency use" status and carried in the trunk of my car. I wore that old coat on innumerable hunts in the Pacific Northwest, on three trips to Alaska and once to Norway. It is pretty grungy, and the last couple of inches at the bottom of the zipper is starting to come unstitched (easy to repair, I know, but I don't sew), but it is still perfectly wearable. In fact, I wore it through the 2004 deer season here in Oregon. But after the hunting season was over I ran across a new Canyon Guide Outfitters coat at my local Bi-Mart discount department store. It was part of a close out sale, priced at about $27 (the regular Bi-Mart price is around $39). It looked so spiffy and its ivory pile lining was so bright and clean that I could not resist. I guess I hadn't seen a coat like this without blood, pinesap, and plain old dirt ground into it for so long that I had forgotten how bright and cheerful a new example could look. I was so proud of my new hunting coat that I wore it to "Shooter's Coffee" on the following Tuesday and "Breakfast with the Boys" on Saturday. (The former is not necessarily all shooters and the latter is about half women, but that is what the late John Rauzon named these weekly events, and the names stuck.) Anyway, our distaff attendees informed me that my new coat was "exactly like those worn by rednecks with one eye in the center of their foreheads," and "real nice for a 1960's style coat." Phooey! What do they know about traditional hunting coats? What I know, from experience, is that this type of coat will protect you in inclement fall weather, even in rain and snow. I also know that its red and black plaid pattern is easily visible to other hunters, but difficult for colorblind game animals to spot. Its wool blend outer shell is quiet in the woods. These coats are also tough and long lasting. And it's okay with me if you choose to wear yours to Shooter's Coffee. What more could a deer hunter ask?